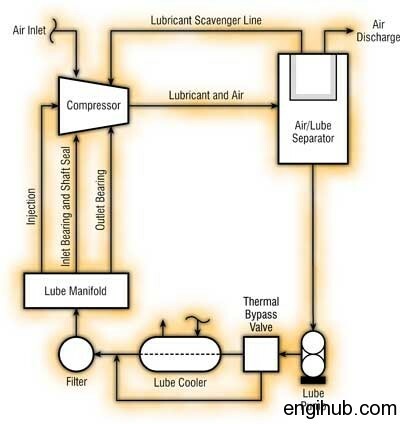 The life of Reciprocating Air Compressor almost depends upon the effectiveness of lubrication oil. Hence the selection of proper lube oil must be considered while operating the machine. All moving parts always require some sort of best lubrication oil to reduce friction between the moving parts. High-quality industrial oil must be used for lubrication of air compressor; my experience has shown that it is poor economy to use cheap lubricants. Normally good quality non-detergent mineral lubrication oil should be used. The sludge and other impurities in the lubrication oil will cause the oil strainer to clog. Hence lubrication starvation to bearings. The ENKLO-220 or SERVO PRESS-220 grade lubricant oil is the best choice for frame lubrication of reciprocating air compressor. The qualities of lubrication oil will depend upon the various devices, which are used in the lubrication system. For purpose of frame lubrication in Chicago Pneumatic Air Compressor, an oil pump is used along with other parts. 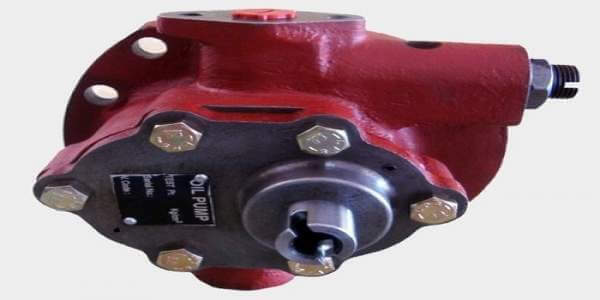 A gear type positive displacement type oil pump is employed in reciprocating air compressor. Hence it is absolutely essential that the correct direction of rotation of the belt wheel is maintained. For this, an arrow is marked on non-drive end bearing housing. Removing front door cover in case of non-lubricated air compressor can approach the oil pump and oil pressure regulating valve. In case the air compressor is run in an incorrect direction, the oil pump will not pump the oil. Hence break-down will occur in the compressor. The oil pressure regulating valve is housed in the oil pump body and therefore low oil pressure switch is fitted. The oil pressure adjusting screw is turned clockwise to increase the oil pressure. You have to remove force feed lubricator along with front door cover in case of a lubricated air compressor. So, you can reach oil pump and oil pressure regulating valve. In case the air compressor has undergone recent overhaul or prolonged storage then it is essential to rotate belt wheel several turns to ensure that the bearings are flooded with oil. The oil pressure gauge connection is tapped through drilling in the frame from the last bearing on the drive end. You are suggested to stop the air compressor immediately if oil pressure gauge fails to show the oil pressure. Rectify the fault before starting the compressor. A shell and tube type oil coolers are used in reciprocating air compressor. 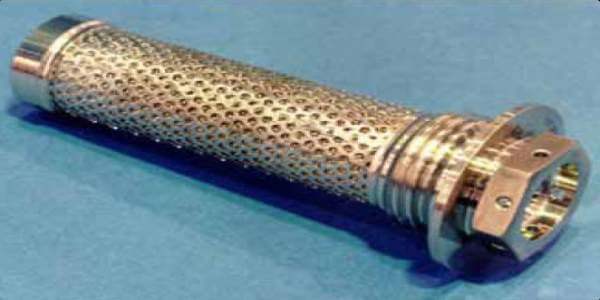 The water is used as a cooling medium, which is circulated through the tubes. While the lubrication oil forced through the shell side of the oil cooler. You should have to remove headers to inspect the tube or water side of the oil cooler. Dirt and foreign matter can be removed either by chemical cleaning or brush. 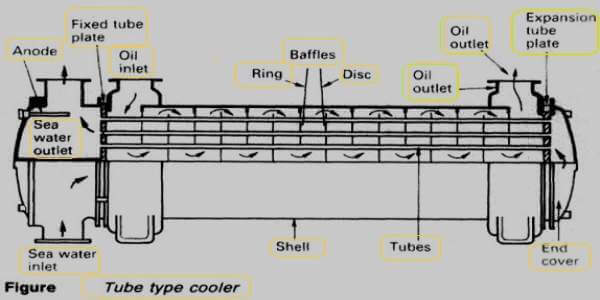 The shell of oil cooler should be cleaned in a trichlonthylen bath and flushed with clean air. This is located on the lube oil suction pipe in the crankcase sump. A build-up of foreign matter or dirt around the strainer will cause a drop in oil pressure. Hence strainer must be kept clean at all times. This strainer must be cleaned at every oil change in Sump. To clean, unscrewing it from lube oil suction line and then washes it in Solvent. 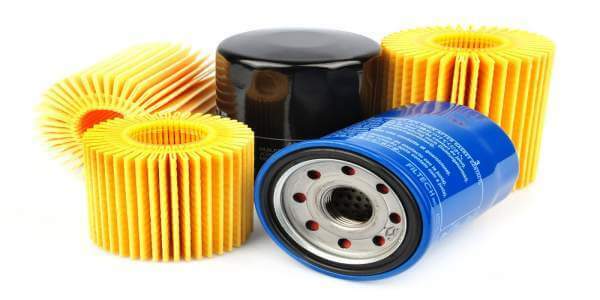 The oil filter used in air compressor lubrication system is of cartridge type. It is used and throws type oil filter. It should be replaced each oil change in air compressor. 6 x oil cooler bundles, brass material, outside diameter 15mm, turbine lube, tube bundles.